What is a good debt-to-income ratio, anyway? If you’ve spent any time on our website or talking with one of our counselors, you know how important a debt-to-income ratio can be. This tool, often used by lenders, can also help us evaluate the health of our individual financial situations. The formula is simple; all you have to do is divide your total debt by your total income and then convert the decimal to a percentage. For a monthly look, take your monthly debt and income figures and use those instead. Oh, and even though the method is simple, we still have a calculator to make it even easier for you. What’s less simple, however, is understanding the significance of your ratio and what it can mean for your overall finances. In the credit counseling world, we think of a debt-to-income ratio as being divided into three main tiers. It’s a lot like a traffic light, with a green (safe), yellow (caution), and red (danger) level. We think that being at or under 15 percent is safe, between 15 and 20 is getting into risky territory, and above 20 percent is a dangerous level. And just to clarify, we are talking about non-mortgage debt here (more on mortgage ratios below). If something unexpected were to pop up, you might also be better prepared if your debt-to-income ratio and overall spending plan looked like this. Of course, we hope you have a healthy emergency savings fund set aside, but even if you were forced to take on new debt as a result of something unexpected, you would probably be OK due to already having it at such a manageable level of 15 percent. For reference, an annual income of $35,000 comes out to a monthly income of about $2,917. A debt-to-income ratio of 15 percent would mean your total non-mortgage debts costs $437.50 or less each month. The next tier is a debt-to-income ratio of between 15 and 20 percent. Using our previous example, if you make $35,000, a debt-to-income ratio of 20 percent means that your monthly debt costs $583.40. At this point, we often find that consumers are still okay and can keep their heads above water. Most likely, they will need to get on a self-pay method, such as the debt ladder or debt snowball and use their self-discipline to stay on top of their debts. But, some consumers might really begin to struggle at this level. After all, how did the debt-to-income ratio slip to this point to begin with. Is it due to an unforeseen event or a need to take out new credit? Is it due to a loss in income that has made minimum payments unbearable? Slipping into this range could be a sign of more trouble to come. Because of this, we recommend that consumers take action at this point. In fact, we offer a free budget and credit counseling session that allows consumers to gain control of this situation. A counselor can help you determine if there is room in your budget to cut expenses and devote more money to your accounts or if your situation might be better suited for a Debt Management Program, especially if you are balancing multiple high-interest debts. Lastly, the tier of 20 percent and above is the most dangerous. For a base income of $35,000, a 25 percent debt-to-income ratio would mean that your monthly debts total $729.25! At this stage, it’s pretty clear that something isn’t quite right. You have more debt than you can really afford. This doesn’t mean that it’s impossible to make it on your own, but it will be tough. You should definitely talk to a credit counselor and see what your best options are. Debt-to-income ratios are much different when we think about mortgages. There are two terms related to mortgage and debt-to-income ratios that you should know: front-end and back-end. A front-end ratio is the percentage of your income that would be devoted to housing costs. When a lender is determining whether they will offer you a loan at a given amount, they will take your gross income, multiply it by their required front-end ratio and come up with a total. This total will be the amount you can pay toward housing, and they may not award you a loan that would exceed this amount. In this example, a lender would likely not want to award you a loan that would require you to pay more than $729 per month in housing costs. This assumes that the lender is using a 25 percent maximum and that their are no other income earners, such as a spouse, in the equation. The lender will also multiply your gross income by the back-end ratio, which is a higher figure. The back-end ratio is higher because it includes your housing expenses along with all other debts. So, this includes the front-end and anything else, like credit cards and student loans. Again, this calculation will return a dollar figure, and your total debt commitments should not exceed it. We hope that this post has been helpful to you and that you now have a better understanding of how to calculate and evaluate your debt-to-income ratio. All in all, you want to do anything in your power to get your debt-to-income ratio under 15 percent. And then, of course, our hope is that you pay off all your debt. For further reading, check out our post on how to become debt free in 5 simple steps, and if your debt-to-income ratio is cause for concern, learn more about how you can chat with a credit counselor at no-cost to you. I like the color-coordination of your chart, Kudos. It is a clean graphic, but taxes do complicate things. I’ve been looking around other sites that mention dti’s of min. 28 / max. 45; Would you want to post something that reflects different tax brackets or possible reconciles the numbers you’re putting out with or without taxes being taken into account? My apologies for not scanning through the other posts if this was already covered, but I feel like it’s pretty pertinent. And btw I don’t try to jump on these pages to demean, I’m on here more often than not to learn and I just thought a post like this would help progress the discussion we’re trying to achieve. Hi Tyler! We appreciate your feedback. Happy New Year! Sure thing! Glad it was helpful–thank you for the feedback! Good question — we don’t cover business loans very often, but it seems as though the standards a pretty similar. I think most lenders will want a DTI to be lower than 36 percent, and it’s a smart goal to bring that down to a more manageable level as soon as possible. Business debt serves a different function than consumer debt, so a higher level is likely more tolerable but you don’t want to put your personal financial situation in jeopardy. Depends on the applicants credit score, down payment, cash reserves, etc… Fannie Mae Freddy mac highest DTI capped at 45 percent. Agreed! This is just a general guideline, but you are right that individual factors play a big role. 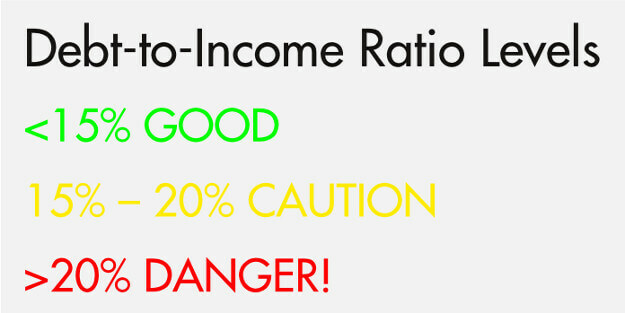 Using gross income, my front end ratio is 14% and back end ratio is 22% so I am well in the green zone. I have 3 kids and education expenses alone are 10% of gross income. Because of this, I almost live paycheck to paycheck. Thankfully, I have some savings but if I lived according to the front and back end ratios, I would be in big trouble. I think the debt to income ratios should be much lower and education expenses should be included in your pie chart. Paul, you’ve raised a really good point here–that children can throw big kinks into our budgets and circumstances can seriously alter the advice (not a one-size-fits all solution). I like your suggestion to add education costs into the graphic, though not everyone will have them. Thanks for the response. This is very helpful! I believe my friend may just be ultra conservative, as I’ve been doing some more research and have found that a front-end ratio of 21.5% is not in bad shape at all, especially on a 20-YR payoff. Your comments help confirm this notion. I appreciate the reply! Good article, but im still a little unclear on my current situation. I’m shopping 2 mortgage companies on a new home build (one is very conservative and the other very conservative. My front end calculates to 18.6% on a 30 yr loan and 21.5% on a 20 yr loan. I want the 20 yr option to get lower rate and pay off quicker. One mortgage rep (also my friend) strongly recommends I be less than 20% on front end, while the other (comes across as a used car salesman) says 21.5% is in “great shape”. Back end ratio is no problem, as I carry very little other debt/pmts. I really want the house, but am confused if the 21.5% is pushing it. The two companies are on complete opposite ends in terms of their advice. Any advice on this would be welcomed. I’d like to also see where 21.5% sits on a distribution scale? Congrats on pursuing your new home! It definitely sounds like you have a good approach for ensuring that the debt is under control. Don’t take this as foolproof advice, but my understanding is that a front-end ratio of under 28 percent is the unofficial “requirement” for many lenders. At 21.5%, you seem to be at a reasonable level where you could devote those resources to your mortgage and still have significant funds to devote to retirement saving, etc. I’ve heard many financial gurus say “Keep your mortgage at or below 25 percent of your pre-tax income.” So you’re also in line with that anecdotal advice. Does your model count car payments as “debt”? Yes, car payments would be considered debt in this formula. Nice article, I like the stop sign analogy. I got these states from an article in Consumer Reports back in the 1996-1997 time frame and have used them since, I find they are good predictors. Jim, thanks for adding your comment! That looks like a great scale as well, and it looks like we are in agreement about 20% being a strong indicator of matters slipping out of control. You’re likely right about 35 percent and bankruptcy, too, which is why we need to intervene early in order to help people save their financial situation. My monthly credit card use is about $3,000 per month of which I always pay it off in full. Should I factor in this full amount when calculating my debt? Or is it only considered ‘debt’ when a card holder carry’s their balance forward? Typically that wouldn’t be considered debt since it isn’t carried over. However, there is one exception that could cause that $3,000 to be viewed as “debt” by a lender. Credit card companies report your balances to the credit bureaus at varying times of the month, not just at the end of the month when the final payment is due. So in theory, you might pay off the $3K on the last day of the month (to avoid interest, and carry over, etc.) but your creditor may have already reported an “outstanding balance” of $3K. This shouldn’t matter much, though, if you have that $3K in your bank account, and will likely offset when you talk to a lender. Just for clarity, do you use your income level not including taxes (net)? I’m assuming so since you don’t have a part of the bucket in the pie visual for taxes…but then further down you mention an example that uses a gross income, which I take to mean prior to taxes being taken out. Andrew, great question and thanks for pointing that out as it can certainly be confusing. The ratios should be determined using gross income figures, which is what mortgage lenders will use. 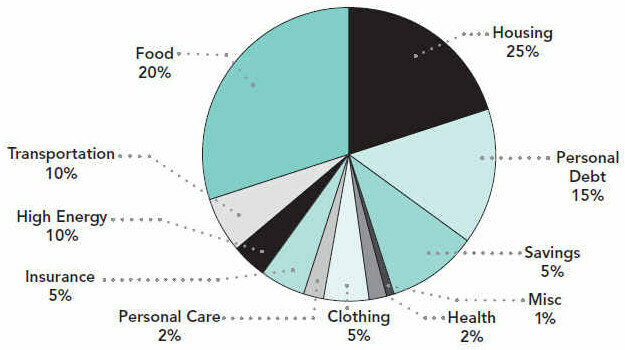 The pie chart should be thought of as a guide for net income, though. I’ll add a note about this to the post. I guess it would have been hard to include taxes in the pie since people pay different rates. Thanks again for the great question and observation. This is really helpful in determining what I can afford for housing. That’s great news, John. Glad we could help!